The Dodgers (1-1) finally were able to snap the Brewers (1-1) 12-game winning streak, dating back to the regular season, with a 4-3 win in Milwaukee on Saturday afternoon to tie up the NLCS. After a bad night at the plate in Game 1, Justin Turner came up big with a go-ahead two-run home run in the eighth-inning. The Brewers burned through six of their bullpen arms in Game 1, so they needed starter Wade Miley to go deeper in Game 2. That’s just what he did, plowing through the Dodgers all-righty lineup like a can of Pringles. The Dodgers and Brewers were locked in a pitchers’ duel through the first four frames, Miley and Hyun-Jin Ryu both looked sharp. Cody Bellinger hit a deep fly ball to right field that seemed to be gone, but he came up just short of a two-run bomb in Game 1. That’s the way this series is going for the Dodgers so far. To start Game 2, Lorenzo Cain robbed David Freese of a two-run home run in the first with a leaping catch over the center field wall, because of course he did. 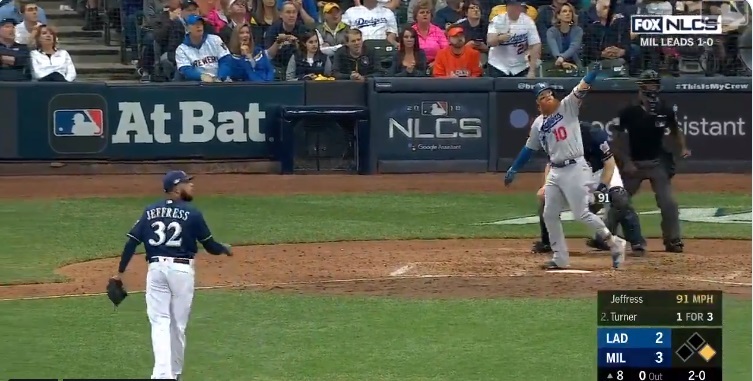 The Brewers’ pitching staff continued to torment the Dodgers … with the bat. Miley doubled down the left-field line with one out in the third. Some sloppy defense by Matt Kemp, who was shifted, didn’t help matters. But Ryu was going to have none of that, and he struck out Cain and retired Christian Yelich to end the inning without any damage done. Manny Machado didn’t help the struggle bus offense when he jogged to first on a well hit groundball to short in the top of the fourth. It’s a must-win game, and the lack of hustle isn’t a good look. Things unraveled for Ryu in the fifth. The Brewers were the first to score on a Orlando Arcia solo home run to center field. Miley came up with his second base hit of the game, a one-out single. Cain roped a double to left field, and that would be all for Ryu. Dave Roberts went to Ryan Madson out of the bullpen. He walked Yelich intentionally to load the bases, and Machado made a nice play on a Ryan Braun infield grounder to get an out at first, but Miley came home to score on the play. Thankfully, that was it for the Brewers. After 16 consecutive outs, Craig Counsell pulled Miley with two outs in the sixth after he allowed a base hit to Chris Taylor. That was just the second hit of the game for the Dodgers, who couldn’t muster anything off him. Corbin Burnes was the first guy out of revolving door that is the Milwaukee pen, and he got Turner to line out to Cain to end the frame. Alex Wood started the home half of the sixth to face lefties Mike Moustakas and Travis Shaw. He struck out Moustakas … that was good. Then he served up a home run to Shaw … not good. 3-0 Brewers. The Dodgers finally got on the board in the seventh once they went to their lefties off the bench. Consecutive singles from Machado and Max Muncy set the table for Bellinger, who came up with a big RBI single. Jeremy Jeffress was the next reliever for Milwaukee, Mr. 30% Strikeout Rate. Joc Pederson flared a base hit to no-man’s land in right field to load up the bases with nobody out. Yasiel Puig couldn’t hold up on, you guessed it, a breaking ball down and away. Austin Barnes somehow held up on a close pitch and finagled a walk to bring in the second run of the inning for the Dodgers. Yasmani Grandal grounded into a double play and slid into first for some reason to kill the inning, rally, and my spirit. In the 8th, Chris Taylor started things with a dribbler up the third-base line for a single, which was important given who was next. If there’s one player who can turn things around with one swing of the bat, it’s Turner. After striking out four times in Game 1 for the golden sombrero, he crushed a Jeffress splitter to left field, a go-ahead two-run shot, to give the Dodgers a 4-3 lead. Frank Thomas said he would have benched Turner in the pre-game show on FOX. LMAO. It was up to the Dodgers to out bullpen the Brewers at that point. Kenta Maeda was the sixth relief pitcher of the night, brought in to face old friend Curtis Granderson with a runner at first and two outs in the bottom of the eighth. Granderson hit a long fly ball to right, but Puig was there to make the catch to end the threat. Kenley Jansen got the ball for the first time in the series in the ninth. He walked Hernan Perez, but he struck out Cain to bring up Yelich with two outs and a man on. Gulp. Yelich broke his bat on a grounder to Turner, and the Dodgers have themselves a happy flight home. Now the series shifts to Los Angeles, starting Monday at 4:39 PM PST on FS1. Walker Buehler (8-5, 2.62 ERA, 3.04 FIP) looks to redeem himself after his disappointing five-run, five-inning start in Game 3 of the NLDS. The Brewers counter with Jhoulys Chacin (15-8, 3.50 ERA, 4.03 FIP). The right-hander was solid in his first career postseason start in Game 2 of the NLDS, pitching five scoreless innings against the Rockies.